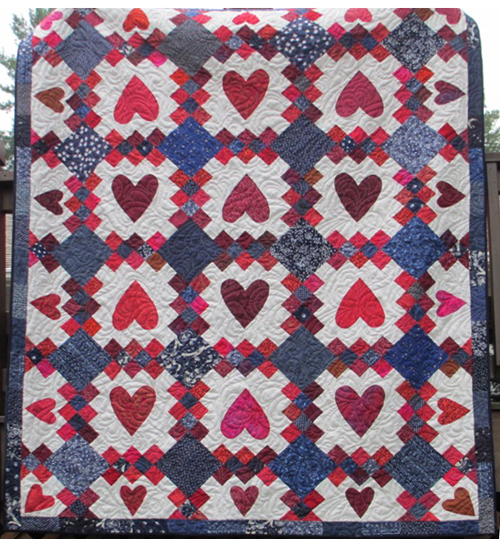 I am so glad you have found quilting – whether through your local quilt shop, on-line with BERNINA, at a quilt guild, or maybe through your local community college. I should warn you that it can become a passion. But that is okay since you will learn so much, make new friends, win awards, travel, make beautiful quilts to keep you warm and to give as gifts. How do I know? My track record of over 40 years of quilt making. I was very young when I found quilting. As a teacher I was naive enough to think a class could work on a quilting frame so that everyone would finish hand-quilting a project in eleven weeks. No way! But, what if we worked on sections of a quilt and then put those together? Well, that worked and hence Lap Quilting. I did not invent it, since this idea had been tried before as Apartment Quilting or Quilt As You Go, but I will brag that I have spent more time than most perfecting this method. Nowadays, I have moved on to machine quilting in rows and hand quilting full size tops on a supported frame. My advice: Explore your field, grow in methods, and keep a quilt diary. I am working on a new book that will detail many of the “live and learn” issues I’ve encountered over the years. For a glimpse of my past, enjoy and share our new Lap Quilting with Georgia Bonesteel YouTube channel, where you can view – all day, any time – the 400 Series of Lap Quilting (1987) and the 1100 Series, Country to Country Quilts (2001). By the way, BERNINA sewing machines all the way for each show! Previous Previous post: Hand Embroidery + Decorative Machine Stitches = Awesome Embellishment!